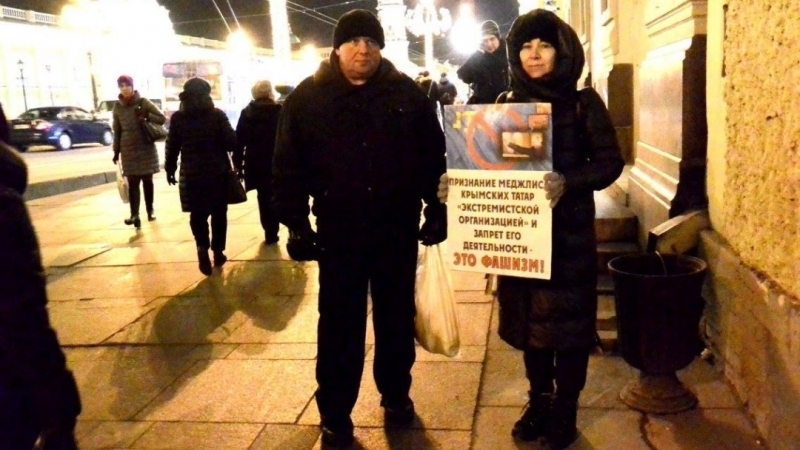 During the pickets which took place in the very center of the city on Nevsky Prospekt, the activist informed the public about the events of November 23, when during the detentions in Crimea, a 83-year-old veteran of the Crimean Tatar national movement Vedzhie Kashka was killed, four people were arrested and sent to the remand center. Among the detained were Bekir Degermendzhi, Kazim Ametov, Asan Chapukh and Ruslan Trubach. The activists also noted that the state of health of Bekir Degermendzhi and Asan Chapukh had sharply deteriorated in the pre-trial detention center. The previous action of Strategy 18 in support of Crimean Tatars passed on November, 18th.